There are no quotation marks delineating conversations here. Only a random, stream-of-consciousness kind of dialogue as one voice interacts with another. What there is is blindness. Unexpected blindness which comes upon its victims in the form of a milky white sea instead of total blackness. While driving home one day, a man sits in his car at the intersection unable to proceed because he has lost his sight. A stranger helps this man to his apartment, and then goes back to steal his car. The stranger becomes blind. The eye doctor from whom the man seeks medical assistance becomes blind. The patients who were waiting in the doctor’s office when the man is called become blind. Blindness seems to rub off from one to another as easily as the hair from a cat when it rubs against you. How does one function when one has suddenly lost sight? How do those around react when an ailment is suspected of being contagious? It’s rather a survival of the fittest here, except for the doctor’s wife, who inexplicably is not without her sight. Yet she has willingly accompanied her husband with the other blind people into the wards of the empty asylum where they are interned. A sort of order begins in the wards. People organize themselves so that the distribution of food which they are given, never enough to go around, is at least given equally. But, how are they to manage cleanliness? Believing that they are unseen, not knowing that the doctor’s wife still has her sight, some defecate on the floor; soon filth prevails. Worse, a kind of mafia has set itself up demanding payment for the food which the government promised would be provided. The soldiers guarding the place are paranoid that the blindness will spread to them, and when the inmates come for assistance they are instantly shot. This book, more than a treatise on being blind, is a treatise on civilization. It is fantastic. This is one of my all time favourites. I am so pleased that you enjoyed it as much as I did, although I'm not sure enjoy is the right word. It is scary stuff – it makes me want to move to the middle of nowhere and become self suffiecient. I loved this book, too. The metaphor is brilliant. I'm glad you liked it. I was just going to tell you that Jackie loved this book, but she already did! I love the stream of consciousness style of prose, sort of like Cormac McCarthy. This one is definitely on my list. Everything I've heard is fabulous. I just KNOW I'm going to like this. I've had it for a good while and it is one of those that keeps getting buried under other books I want to read. Time to yank it back toward the top of the stack! Jackie, you're right; "enjoy" doesn't seem like quite the right word. Maybe "absorbed" would be better? For one thing, it made me so grateful for my sight, which is the thing about my body I would most hate to lose.ds, it is a brilliant metaphor. Still, I could see substituting blindness for any ailment which effects community. Poverty comes most readily to mind, also I was reminded of what I've read about the German concentration camps during WWII. It's so interesting to see how different people react to terrible adversity. Some seem to buck up so bravely and help one another while others abuse fellow man even more.Sandy, I've not read McCormac yet, although I have the audio for The Road on my iPod. I've kept away from it, somehow dreading the dismal quality, and yet this book was dismal in many respects. I think I'll let some time lapse before listening to The Road, though. Terri, I'll enjoy talking to you about it when you finish it.CJ, thanks for liking my review. Sometimes it's hard to know how much to reveal and how much to keep hidden about a book. I haven't seen the film, although my copy's cover has an advertisement for it on the front. I'm not sure I'd want to see it in such graphic detail; reading it is more palatable somehow. I have been meaning to read this for a while. Really must get around to it! Wonderful review! I've been wanting to read this book for some time now. What a premise for a book…This is sensational, I love your write up…I'm going to look for it, next month, when i might just have the money lolGreat review as well sweet Bella, sorry I had forgotten you, I don't know how I could have!!!! We don't forget each other Lorraine. We just have too long of an interim between visits! You're always in my mind, though. Didn't I tell you once I thought we looked alike? You and I have a lot of similarities. I thought Blindness was a very powerful book. If you enjoyed this you might also like my favorite Saramago, All the Names, which is a much lighter story regarding the Central Registry of Births, Marriages and Deaths. It is a very funny fable about bureaucracy and a lowly clerk. I also enjoyed Death with Interruptions, his newest book published in English. is this the same one they made the movie out of – starring Mark Ruffalo? Moo, this is my first novel by Saramago so thanks for suggestions of other ones by him! I'll be sure to look into them as I trust your opinion.K13, it is the film starring Mark Ruffalo. You can see more about it here. I can't imagine what graphic detail must be viewed, or omitted, in the movie. Did you happen to see it? I loved this book! I haven't read anything else by him, but boy, oh boy, did this one ever stick with me. I'd like to see the movie. I think. You're braver than I, Les. The visual imagery I have from the novel alone suffices for me. I won't forget this book any time soon; its premise, its follow-through, its 'treatise' on humankind is powerful stuff. 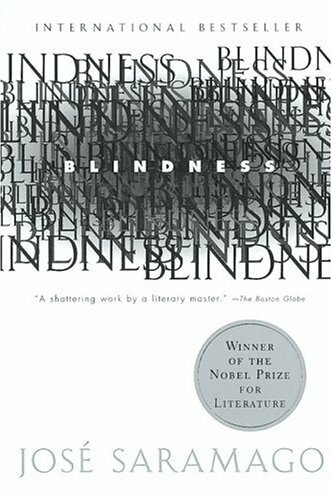 Blindness is a disturbing, powerful novel and a very intelligent metaphor for our horrifying modern world. Although the movie isn't well received, I loved it too. Have you read the sequel, Seeing? It's an excellent critique of democracy.